Many less-experienced computer users do not back up their data until they discover how costly and time-consuming it can be to recover data from a computer crash. And there are often situations in which ill-prepared users permanently lose files, some of them priceless. The causes of these crashes may vary - a momentary lapse of power, a virus attack, or just a small computer glitch - but the result is the same: The computer does not start, some files are hard to recover, some files may be lost forever. Moreover, even simply restoring the computer to its working condition is a lengthy process. Just imagine, you have to make a fresh system setup, then install all programs you need, recall all settings and passwords, and so on. Even thinking of it may make you tremble. And always, it seems, such a disaster happens at the worst possible time: when the working computer with its data is urgently needed. An even worse situation would be a system crash involving a corporate server that the business of an entire company relies on. Restoring it to working condition could take days, if not weeks. Losses from such a catastrophe may skyrocket to such heights that the company might never be able to rally. Well, system failures can't always be prevented, but there is one proven solution that will minimize the damage: a regular and reliable data backup program. If you have a backup on hand and working backup and restore software, restoring your Windows system to full operation will be measured in hours - be it a notebook or a large corporate server. So data backup and restore software is a must for anyone who really cares about his or her data. There are many such programs on the market, some of them for home users, some of them for large corporations. 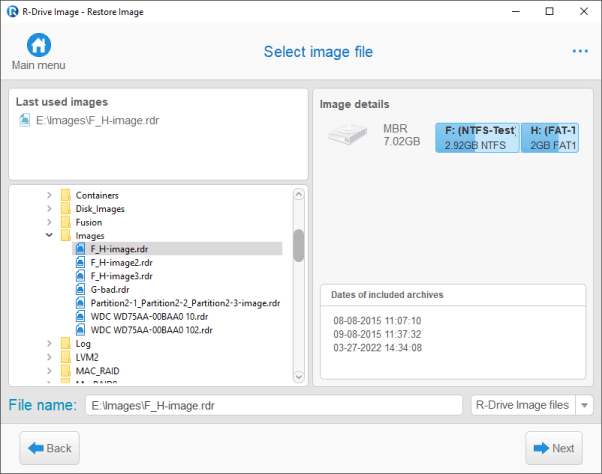 But there is one for all: R-Drive Image from R-Tools Technology, Inc. But how could that be, you ask? How is it that a home user can use R-Drive Image just for simple system disk backup and restore operations, without having to delve deep into the complexities of computer science, yet a professional system administrator can use it to back up a number of large corporate servers on a network computer according to a complex time schedule? So, let's take a closer look. And you may always take advantage of R-TT's standard try-before-you-buy policy, in which you have 15 days to test-drive a fully functional R-Drive Image trial version. 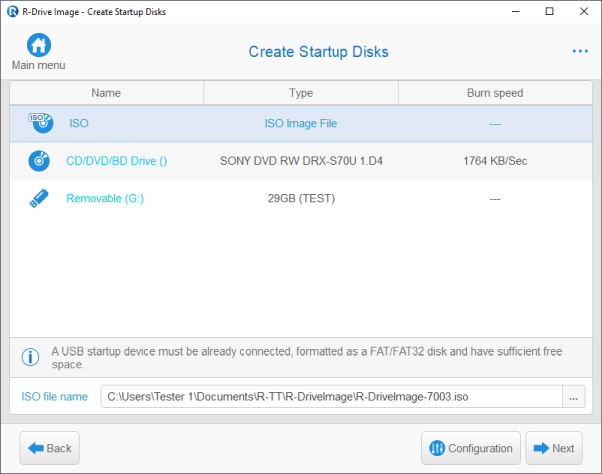 The only limitation of the trial version of R-Drive Image is that the startup disc for the software (which you can create using a bootable media device such as a CD, DVD, or USB drive) can be used only on the PC that has the trial software installed. A simple wizard task-oriented user interface. Everything from creating a disk image of a simple notebook to a complex data backup task of a server can be done from wizards. That ensures that no important parameter will be missed, yet those that are not important can be bypassed with a simple mouse click. Even complex scripts can be created from the wizards. Support for various storage types: local hard drives, removable media such as external USB hard drives, flash memory cards, CD or DVD drives, and network drives. You may use what your task demands and budget allows. Support for differential and incremental backups, image file compression, and backup sets to keep disk-space requirements as low as possible yet maintain consistent data backup for a long time. Image files can be connected as read-only virtual logical disks. There's no need for you to restore the entire disk when you really just want to copy a few files from an image of your five-years-defunct disk. You may read about how to do that in our article: Accessing Individual Files or Folders on a Backed Up Disk Image. A scheduler to launch data backup and recovery tasks at predefined time/event moments. No need to remember when you did the last backup and when a new one is due. Emergency system recovery, portable computers included. Users have the option of choosing from among a wide array of storage devices for both their system disk image files and their startup program: external USB hard drives, flash memory cards, and, of course, CD or DVD drives. This is especially useful for "netbooks" usually lacking CD/DVD drives. With today's prices and storage sizes of external flash memory drives, you may keep the image file of your system disk and startup program on a single, affordable device. No more do you have to carry an external CD, DVD, or external hard drive in your luggage just to restore a corrupted system. You may recover your computer right in the middle of a flight-say, from New York to L.A. - if you discover that the system became corrupted by a virus attack while you were at some open, public WiFi spot. You may read more about how to be always ready for emergency system recovery in our article: Computer Recovery and System Restore. Disk cloning. You may easily transfer your system to a new disk from the old one when you upgrade your computer. Flexible parameters: extending/shrinking partitions, etc. R-Drive Image constitutes a single solution for all corporate needs: emergency system recovery for portable computers, maintenance backup for desktops, a mass system deployment for corporate computers, complex scheduled data backup and restore tasks for corporate servers, and so on. A very user-friendly license policy: To date, R-Drive Image is the only data backup software on the market whose license allows the user to run it on a server for the same price as for a workstation. Volume licensing for large corporations. Data on RAIDs can be backed up and restored as well. Backup sets allowing for flexible image file management. You can specify how many files are to be kept on a disk, how much disk space is allocated for data backup, and how long the files will be kept and have no fear of compromising data safety. 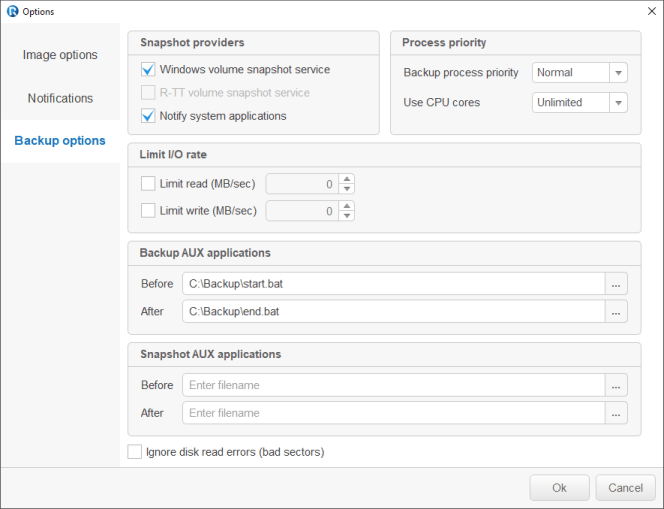 Support for file system snapshots and Microsoft Volume Shadow Copy Service (VSS) to create consistent point-in-time backups. Powerful scheduler for flexible unattended automated data backup and restore tasks. Powerful scripting allowing for automated or manual script creation for the most demanding and complex data backup and restore tasks. Such scripts can be included in batch files for system management tasks. Scripts can be created right from the wizard interface. 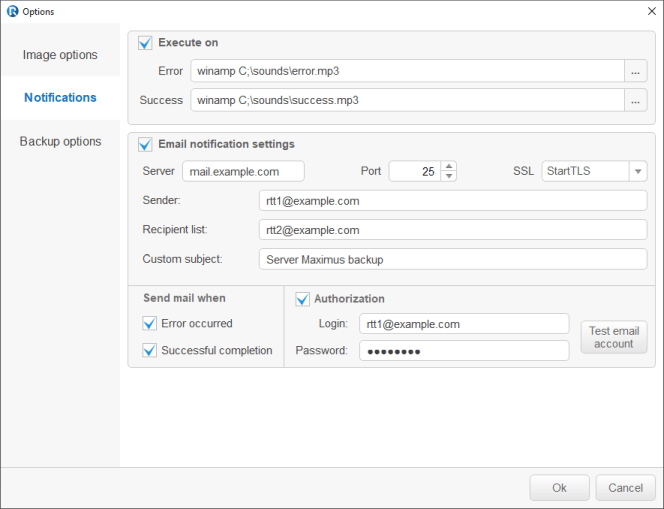 Flexible e-mail notification of a scheduled task execution. 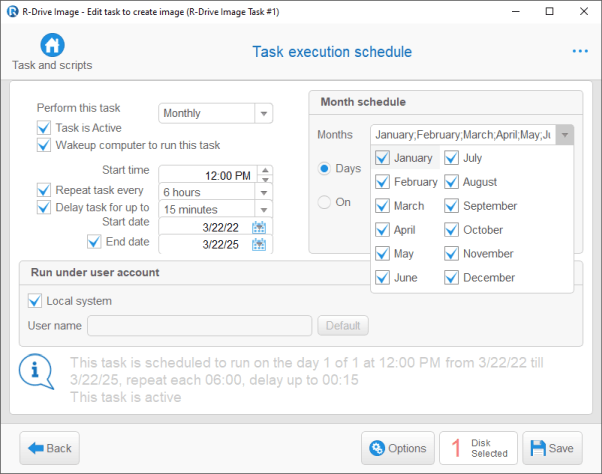 Various programs can be started automatically before and after a task. Such programs can vary from a sound alert to disk wipers and cleaners. A very attractive Local Technician license allowing its user to run R-Drive Image on an unlimited number of computers and servers consecutively. That can be easily done by using the startup version of R-Drive Image. With it, a data care technician can create backup disk images for his own computers as well as for his customers' computers without buying additional licenses. A Network Technician version of R-Drive Image is under development now and will be launched soon. This version will allow a technician to create and restore data on a remote computer over a network. Particularly noteworthy is that the images can be stored on the served computers, eliminating the need to transfer huge image files over the network. R-Drive Image Commercial System Deployment license for computer manufacturers and system integrators. The license grants system integrators, consultants, and computer assemblers the right to install standard system images on multiple machines for their customers. The license permits either cloning different system images on one PC or using one CD startup set an unlimited number of times. 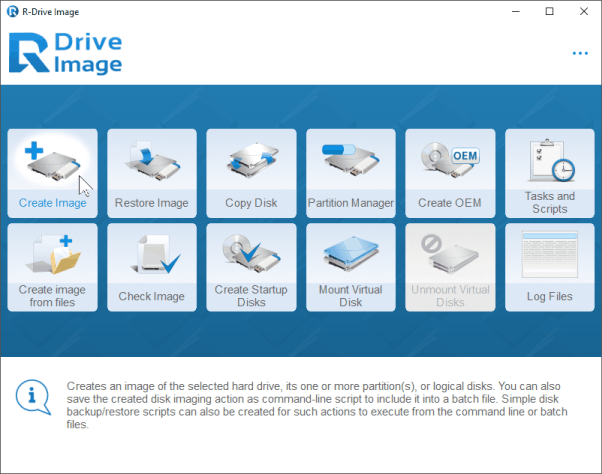 You may read more about how to use R-Drive Image for mass system deployment in our article: Disk Cloning and Mass System Deployment. R-Drive Image OEM kit for computer manufacturers and system integrators. The R-Drive Image OEM kit grants system integrators, consultants, and computer assemblers the rights to create special system recovery disks/devices and include them with their fully assembled computer systems. The end user of such computer systems can use those system recovery disks to restore the system files, registry keys, installed programs, etc., to the state in which the computer system or hardware was initially set up (a fresh setup). The master image can be placed on the startup disk(s) or on a separate device. 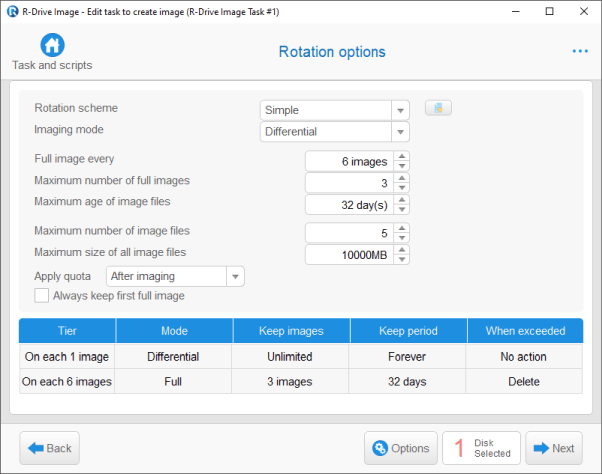 Flexible data restoring: The user can have R-Drive Image automatically find the disk to restore data to, or the user can manually select places for data recovery. And once again, all of these tasks and many more can be performed by R-Drive Image alone. Why is that so important? Well, this means you need to learn only one program rather than many. And last but not the least, this all-purpose, feature-rich data backup and restore software comes at a very competitive price.